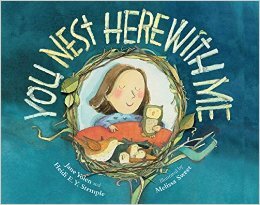 You Nest Here with Me is a beautiful, lyrical picture book by the mother daughter team of Jane Yolen and Heidi E.Y. Stemple. Illustrated (perfectly) by Melissa Sweet. It’s a book about birds. What? You say that’s not enough? Okay then— It rhymes. It rhymes brilliantly. The back flap copy on the book states that Jane Yolen has written “350 plus books” (practice makes perfect?). She co-wrote this book with her daughter and the rhythm and rhyme are spot on, clever, and unexpected. It is a lovely poem about birds’ nesting habits and each stanza ends with the musical, repeating refrain, “but you nest here with me,” it’s lovely. But add a little more, please? Okay, if the beautiful poem isn’t enough, how about that it teaches you things? Really interesting things like that the Killdeer bird pretends it has a broken wing to lure predators away from its nest. This writer-team takes us through all the different places that birds nest and teaches young readers and would-be bird watchers about their habitats. All while rhyming mind you! How about adding some amazing illustrations by amazing illustrator, Melissa Sweet? Melissa brilliantly pulls out the defining characteristics of the different species of birds basing them in realism, but injecting them with her style and character. The birds are full of personality without becoming cartoonish. They aren’t stiff and her landscapes shift in palette to reflect the birds’ varied climates and locations. I love Melissa’s beautiful collage work, and she’s the master of it, but I enjoyed that in this book we see more of her gestural drawing skills that need nothing more than a washy sweep of chartreuse to become a crinkled blade of grass. What? More? Now you’re just getting greedy. But, okay, there’s some fun back matter to answer all your questions about birds and nesting. Questions that you didn’t know you had until you read this story. Seriously, people, don’t you think that’s more than enough? 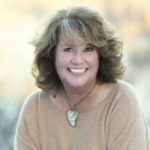 Boyds Mills Press, Heidi E.Y. Stemple, Jane Yolen, Jennifer Black Reinhardt, Melissa Sweet, You Nest Here with Me. Bookmark. It’s enough to make me want the book, that’s for sure. Thanks, Jennifer! Sounds lovely. Thank you, Jill— hope you like it! 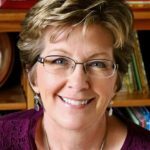 Jennifer–I absolutely LOVE this book! I’m a complete bird nerd, but even if I weren’t a lover of birds, it’s just the perfect night-time lullaby book. The text sings, and the illustrations shine. It’s a gem of a book! Hi Maria, I’m glad that you love it, too. And you’re exactly right— a lovely lullaby even if you’re not a bird nerd! Thanks for visiting! You’ve convinced me, Jennifer! Heading to the library to check out this lovely book. Thank you! Oh good, Liz, hope you like it! Thanks for commenting! Oh, man. You beat me to it–I was planning to write about this book in my July post. Yet another bird’s nest book–and this one so sweet and gorgeous with interesting facts to boot. It’s really a perfect picture book. And, of course, anything illustrated by Melissa Sweet . . . enough said. Great post of how to do it like the masters. Thanks! It’s indeed a perfect book in so many ways. Great review Jennifer, thanks for the post! Thank you, Damon, for visiting and commenting! Glad you like the book, too! Excellent review. I’m zipping over to Amazon right now. Sounds wonderful Thanks for the post. I think/hope you’ll like it Robyn, thanks! Can hardly wait to read this! Thanks for posting. Thank you, Virginia! Hope you love it! Thanks for visiting and commenting, Katrina— hope you like the book!